In one of the harshest climates on Earth, grizzlies are clinging to life. 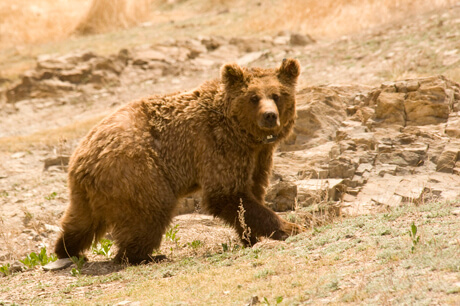 In the Mongolian portion of the Gobi Desert, low rugged mountains create enough shelter to support a remnant population of Ursus arctos, the same bear we know as the grizzly or brown bear in North America. In the Gobi, just 2-4 inches of precipitation fall per year and temperatures swing from minus-35 Fahrenheit in winter to 115 in summer. The Gobi grizzlies are undersized by North American standards, surviving on a diet of plants and occasional rodents. Recent tracking and hair sampling studies indicate a population of just 25-40 bears, who cluster around three oasis complexes where small springs anchor plant and animal life. Since 2011, Vital Ground has supported the Gobi Bear Fund, which supports research efforts and a limited program of food supplementation for these embattled bears. Spearheading our Gobi Bear Initiative is biologist and Vital Ground trustee Douglas Chadwick, whose new book Tracking Gobi Grizzlies documents first-hand the effort to research and recover these bears. Most recently, Vital Ground support allowed the Gobi Bear Project Team to capture and collar two middle-aged female bears, whose GPS data will provide valuable habitat selection information that could help future conservation initiatives.